I come, O Lord, unto Your sanctuary to see the life and food of my soul. As I hope in You, O Lord, inspire me with that confidence which brings me to Your holy mountain. Permit me, Divine Jesus, to come closer to You, that my whole soul may do homage to the greatness of Your majesty; that my heart, with its tenderest affections, may acknowledge Thine infinite love; that my memory may dwell on the admirable mysteries here renewed every day, and that the sacrifice of my whole being may accompany Thine. God has given you the power of working miracles continually, and the favor of answering the prayers of those who invoke your assistance in misfortune, anxiety, and distress; we beseech you, obtain for us from Jesus, through Mary, His Blessed Mother, what we beg of you so fervently and hopefully, if it be for the greater honor and glory of God and for the good of our souls. Amen. 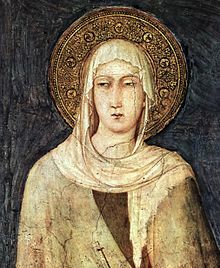 Blessed Saint Clare, whose very name means light, illumine the darkness of our minds and hearts so that we might see what God wishes us to do and perform it with a willing and joyful heart. Before your birth, a Heavenly voice foretold that you would be a light illuminating the world. Be a light to us in the sorrows and anxieties of this earthy life, and lead us into the eternal light of our home in Heaven. Amen. God of mercy, You inspired Saint Clare with the love of poverty. By the help of her prayers may we follow Christ in poverty of spirit and come to the joyful vision of Your glory in the Kingdom of heaven. We ask this through Our Lord Jesus Christ, Your Son, who lives and reigns with you and the Holy Spirit, one God, forever and ever. Amen. speak to Him of my afflicted body and my broken spirit. our Savior, and our Lord. Amen.